If you're really in to woodworking, get ready for inspiration overload! 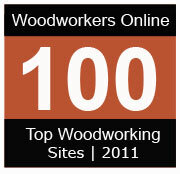 We are excited to announce our Top 100 Woodworking Sites for 2011! Well done to all those that have made the list!